I find the recent films of Kathryn Bigelow equally difficult to criticize and to praise. Points of comparison are lacking because no one makes films the way The Hurt Locker, Zero Dark Thirty, and now Detroit are made. Looking back further, it’s tempting to say Bigelow once helmed very of-their-time action movies, Point Break and Blue Steel. But even those relationship-entangled crime movies are bookended by drifting bands of vampires and a two-and-a-half hour sci-fi saga where Ralph Fiennes and Angela Bassett use data discs to discover people’s hidden memories. OK, so no one makes movies like Kathryn Bigelow. Hers are all uncommon combinations of sweeping and intimate. Though her films don’t come nearly often enough (that four-year, not two-year, clip is one of the worst anecdotal indictments of sexism in Hollywood), every time a new one arrives the feeling is, “Man, she got after it again.” You’d be hard-pressed to find another veteran director who doesn’t have a single phoned-in movie on her or his resumé. Over the course of her career, what separated Bigelow from being, say, a much better Phillip Noyce, or John McTiernan with stranger tastes, is her partnership this decade with screenwriter Mark Boal. The former journalist has provided the first-hand, prestige stories upon which Bigelow brought her visual voracity out of Hollywood fantasy and into something like reportage. Their promise as a team is always information-meets-tension. Bigelow has made, and I’m not sure anyone has said this loudly enough, the two seminal American war films of the millennium. Whatever you think of their politics, their overall touch, and whether the killing of Osama Bin Laden should have been depicted in pitch dark for 30 minutes, The Hurt Locker and Zero Dark Thirty present razor sharp worlds that are terrifying for their stakes and hazy in their ethics. Sounds like modern combat to me. It’s easy to recognize these artistic properties in Detroit, a dramatization of the 1967 murders at the Algiers Motel perpetrated by Detroit PD. The movie also hangs in the fog of “war” (more on that idea in a minute) and the broad circumstances of injustice that fed into and out of the fateful night at the Algiers. Its scope is shaped like an hourglass, or maybe a blood vessel that’s being pinched in its middle: whole buncha setting, flashpoint, long denouement. It’s an incredibly ambitious way to make a movie. There are also reasons why directors don’t do it. Detroit opens with another incident, one that launched the initial five days of riots. A party of black Detroiters is interrupted by police action. The civilians don’t have a liquor license for their after-hours club, and the police are portrayed as mostly diplomatic in the way they shut it down. But the by-the-book approach is meaningless at this point. The westside neighborhood has been scorched by police brutality, and a paperwork problem can easily double as a backbreaking straw. Rocks turn into molotov cocktails from angry onlookers, and the Motor City turns into an explosion of itchy trigger fingers, looting, and residents frighteningly unable to go about their lives. The cityscape is reminiscent in many ways of Bigelow’s Baghdad from The Hurt Locker. And if you don’t register that, a city cop will tell you it reminds him of his recent tour in ‘Nam. In the roving first 45 minutes of the film, we meet the characters who will funnel into the Algiers. There’s a cruiser of cops who will end up doing the terrorizing, and we see their leader (Will Poulter) shoot a man who was looting groceries in the back. We meet Motown hopeful Larry Reed (Algee Smith), lead singer of The Dramatics. After a showcase is cut short by the riots, he despondently heads down to the motel with a friend, and they socialize with two white women. 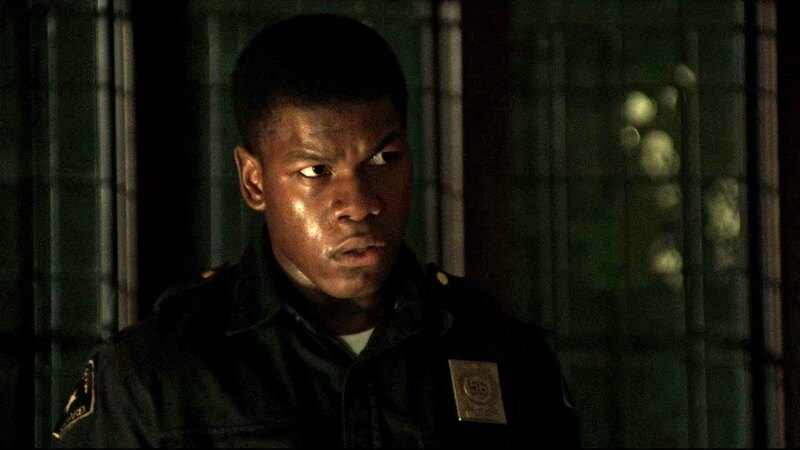 And then there’s the man who seems destined to be caught in the middle of it all — security guard Melvin Dismukes (John Boyega). He’s been commissioned to guard a grocery store during the looting, and he’s in the unique position of playing mediator between angry black teenagers and white cops who perceive an enemy in every black person they lay eyes on. These are the characters who will spend the second act of Detroit in a house of horror. And that’s not be said lightly. It’s sickening to feel the psychological resonances of a Saw film in a retelling of a real-life event. Detroit PD, the National Guard, and Dismukes descend on the hotel after a guest fires a starter’s pistol at the guardsmen for a laugh. With the guests lined up against the motel wall, being beaten by gun butts and violated by gun barrels, Detroit trades its Hurt Locker resonances for those of Zero Dark Thirty. To find out who fired on them, the cops institute a particular brand of torture: the Death Game, in which they pretend to execute the young motel guests until someone admits to being “the sniper” they believe to be in the motel. The tactics are practiced, intentional, and they carry a disgusting flag of homeland defense. However they extract this information, it’s crucial to the security of this city, they argue. The result of the evening will be a massacre not dissimilar from a war crime. Three black men are killed, and nine others (including the two women) are beaten. There’s no one in the game who can make you feel the intensity and sensory exhaustion of that house like Bigelow. Over and over, her camera pans across the line of prisoners and then finds itself just under and behind the jawbone of a character. This is Bigelow’s favorite perspective. It’s close, obviously. It’s more physical than shooting someone’s eyes. You can see precisely how an actor is holding tension in his face and body. And it’s also slightly behind the characters, a vantage point from which the camera can be diligent in it observation of the torture. Of course, even though it may remind the viewer of a war, this isn’t a war. It’s Americans with power killing and traumatizing Americans with none. Taking it in, it’s fair to wonder if the film is running too high on energy and too low on empathy. Bigelow and Boal would probably argue, no, they empathize with what these people when through, and they understand it through the portrayal of PTSD (one of their favorite filmic topics). They’re right of course, but isn’t the more interesting symptom of trauma more than a tremor? The filmmaking is intuitive, but the structure of the screenplay is where Detroit has outthought itself. As always, Boal’s script feels studiously researched but not content to let characters just unfold and develop naturally. The story seems determined to be taken as pure nonfiction (even though it is not), and it won’t give over to the POV of a key character. In fact, it won’t even pick that character. It’s baffling that Dismukes does not become the centerpiece of this movie; he has feet in two worlds and it feels like his soul should be at stake. Instead, he gets alienated both from the Algiers event and from the film as it goes on. Is that more real than making him our window into the story? Probably. But movies don’t impact you because they feel like a set of facts. There’s a reason epics often hinge on one hero. No, Detroit is trying to do Crash without the narrative device, and it’s trying to do semi-fiction like it’s God and Edward R. Murrow’s own truth. This event was a mountain of racial politics, centuries of history, and first-hand details that can never be corroborrated. That’s a combination that set O.J. Made In America soaring across 10 hours, and it clearly had a human focal point. Detroit is trying to do that in 2:30 while never picking one. As a white person tapping away about a movie made by white people about black people — and which has spurred discussions about the efficacy of white artists rendering black pain — it feels right to acknowledge my biases and what I’ve heard from black critics about how Detroit landed with them. On their podcast Still Processing, Jenna Wortham and Wesley Morris noted the movie has rendered the cops as the most interesting characters in this story. In his review, K. Austin Collins cites Boal’s script in particular as failing to consider that the black residents of Detroit have their own political imagination. I’d agree heartily with both points. And while I’m not sure where I fall on white people making art about black people as a rule — umm, if you feel like you have to do it, do it really well and really thoughtfully? — these criticisms also relate clearly to Detroit’s existence as a movie, not just a political act. It lacks and strays from and confuses a story that seems like it should be about a few black Americans and their experience. Boyega is phenomenally measured in his characters conflict, but it’s endlessly frustrating not to see him get to run with the part. Meanwhile, while Poulter’s performance is pathologically villainous, the script gives him ample room to speak in the many different manipulative voices of someone playing both public servant and abuser. That imbalance is either clumsy or troubling given the story Boal and Bigelow have elected to tell. So Detroit has bitten off more than it can chew, but it also doesn’t want to chew the material for fear it wouldn’t maintain its documentary-style approach. It’s like Bigelow and Boal don’t want to be too earnest about retelling this story, too radical, too anti-Blue. And yet they’ve chosen to recount a specific historical flashpoint about police brutality and the systems that let it happen, so why not live up to the commitment you’ve already made? After all, the tagline for the film is “It’s Time We Knew.” That’s a crusader’s credo for a movie that doesn’t have to be Fruitvale Station to be successful. Just make space for actual, felt humanity between the handheld cam and the typewriter.